The True story Of Peep Peep: I found her egg the last one deserted in the grass. It hadn’t hatched with the others in time. The mother had many chicks to tend to & had to leave it behind. The egg was covered with ants & had only a tiny peep hole where she was peeping through it still alive. Desperate, I brushed the ants off bringing her egg in and turned to the internet for help. I didn’t know anything about ‘birthing no babies’ (chicks or otherwise). I held her egg gently in my hand occasionally turning it while it was wrapped inside a damp, warm, wash cloth. It got very tiring for both of us, I recalled the story ‘Horton Lays A egg’. She was very large, couldn’t turn in her egg anymore and seemed to be trapped. The very tiny pieces I managed to peel off through the hours showed her veins exposed on the outside surface of the skin. This indicated she wasn’t quite ready or she would bleed to death. We had to be patient and let time do its work. I fed her with a sm dropper – 1 tiny drop of water now and then into her exposed beak which she’d swallow to give her strength. She talked to me the whole time. After 12 hours the veins grew into the skin and normalized. I managed to get enough of the shell off, taking it off in tiny bits as it was warm, moist and soft. She was still attached to the yolk through her umbilical cord getting her colostrum that would provide her hours of newborn strength. After that dissipated and was used up I gently cut the cord with a sterile tiny scissors and she lay back on her blankets and rested (we both did). A few hours later, she was fluffed and peeping awake! A healthy baby chick! We had bonded and I said a grateful prayer. 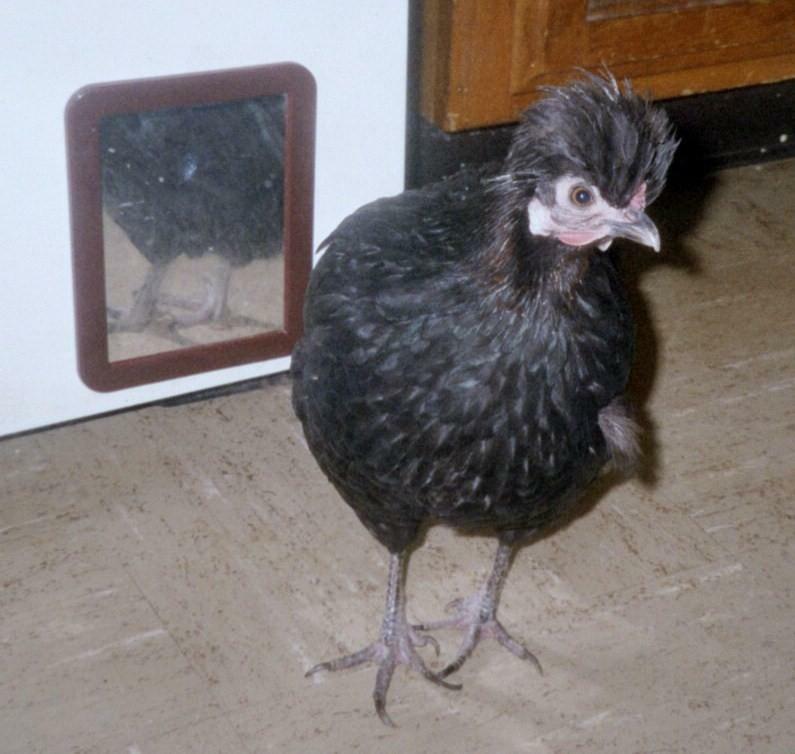 Later I attempted to re introduce her to her real chicken mother who let out a surprised cackle of pleasure when she recognized her chick. She walked off with her brood turning and calling her lost baby to follow them. I sadly steeped back to let her go. ‘Peep Peep’ turned instead and ran after me peeping her head off as if to say ‘Mama! Wait up!’. And that’s how I became a chicken mother. And I couldn’t be prouder of her or love her more if I had laid her myself! She’s the boss of the household. My cats are a bit afraid of her. She’s a strong disciplinarian! Please take the time to send mails to the people below, even if you are not South African, you can assist us in applying some pressure! You gave your voice on behalf of South Africa’s mother pigs last week and we gained a break-through! Mr Simon Streicher, CEO of the SA Pork Producer’s Organisation proposed a partial phase-out of the infamous sow stalls/crates by 2020 with the proviso that after 2020, if stalls/crates were still used, they would allow pigs to turn around, and in addition pigs would not spend more than 63 days in them, each pregnancy. But this is not good enough!! These are contraptions of torture and torment that we are talking about!! Compassion in World Farming (South Africa) needs your voice again! 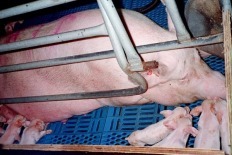 Please write to our supermarkets and enlist their help in fast-tracking a ban on sow stalls/crates. Please help release the 103 000 mother sows who produce the young pigs that provide the ham and bacon products on your supermarket shelves. Please ask your suppliers to become part of the solution in freeing them from this existence of deprivation, immobilisation and torment. Sow stalls/crates are already banned in the UK and Sweden and are being phased out by New Zealand, Tasmania, EU member states, some states in the USA, and the pork industry in Australia recently decided on a voluntary phase-out by 2017. With your help we can eradicate these unconscionable contraptions of meat production from South African animal agriculture altogether.